This review by Dana Crum appeared in the Jan./Feb. 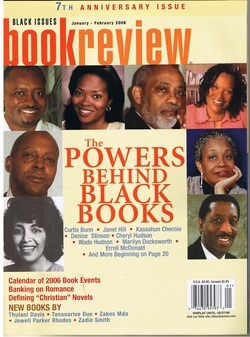 2006 issue of Black Issues Book Review. Wallace Ford’s debut novel depicts The Pride, the African-American elite. The book focuses on four prominent members – Paul Taylor, a shrewd attorney; Diedre Douglas, owner of a financial advisory firm; and Gordon Perkins and Jerome Hardaway, CEOs, respectively, of America’s largest and second-largest black-owned investment banks. Though the income of these lions is comparable to that of their white counterparts, The Pride wields less power because it has less access to capital. Hoping to remedy this problem, Paul suggests that Gordon, Diedre and Jerome merge their companies into one large investment bank. Such an I-bank would be able to raise enough capital to advance business enterprises as gargantuan and dominant as the Microsoft empire. Gordon, Diedre and Jerome recognize this. The question is can they get past their competitive instincts and mutual distrust and merge their companies. Eventually, they do accomplish this feat. While the story Ford sets out to tell in The Pride is noteworthy, the writing itself is often flawed. Too often he tells us what a character is feeling rather than showing us. Sentences like this gem are common: “An anger flowed over every aspect of my being like lava launched from some volcano deep in my soul.” Another scene-level problem is the dialogue, which is sometimes unrealistic, contrived or flat. On a more macro level, the voices of the different narrators occasionally blur together, as though the same person is speaking. Inconsistencies also trouble the narrative. And then there are the sentences. Clichés and purple patches abound. Here’s just one: “She already had the keys to my heart.” Some of the phrases are utterly redundant: “spectacular spectacles,” “frantic, frenetic business” and so on. Other phrases are cumbersome. And yet the novel redeems itself some. The suspense, conflicts and reversals keep the reader turning pages, and Paul’s bereavement is often rendered with true poignancy. Ford has served as a speechwriter, feature writer and attorney. While composing The Pride, he partially mastered the craft of fiction. This reader hopes Ford will complete his tutelage while working on his next novel.